I did some machine sewing and used a fun border punch. 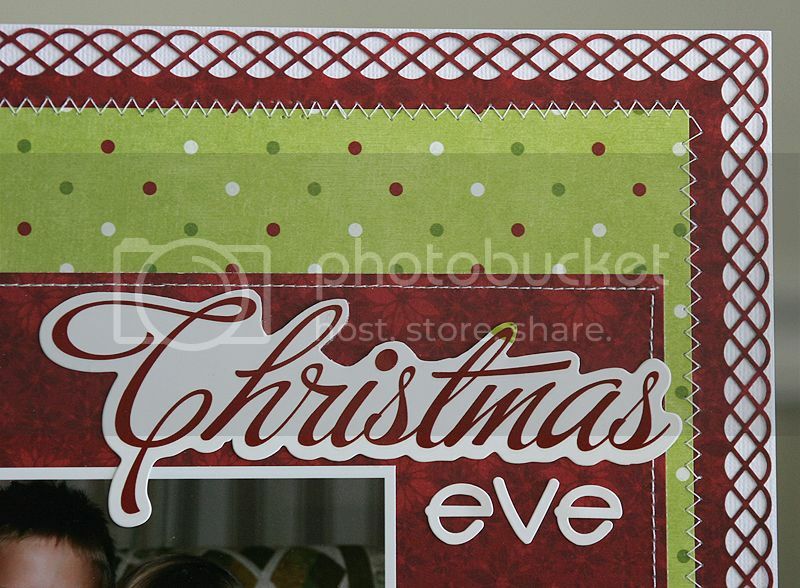 I also did a bit of fussy cutting and removed the word Merry from the Christmas die cut so it would work with Christmas eve cookies. Next up, a layout using an old black & white. You all know I love the old b & w's!! 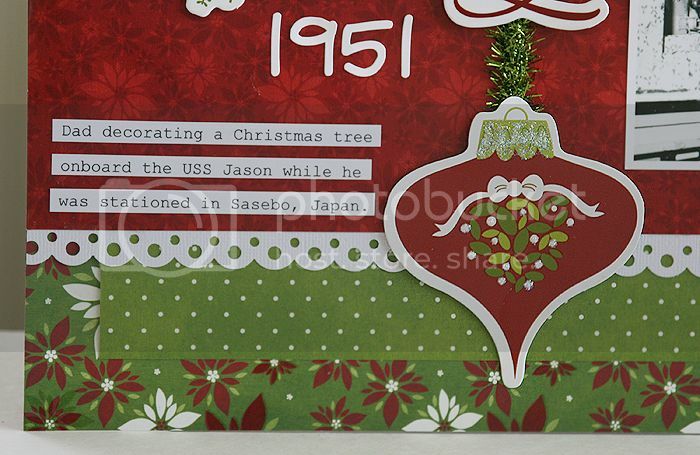 Another fun border punch on this one, and I added a little piece of tinsel garland to the ornament. 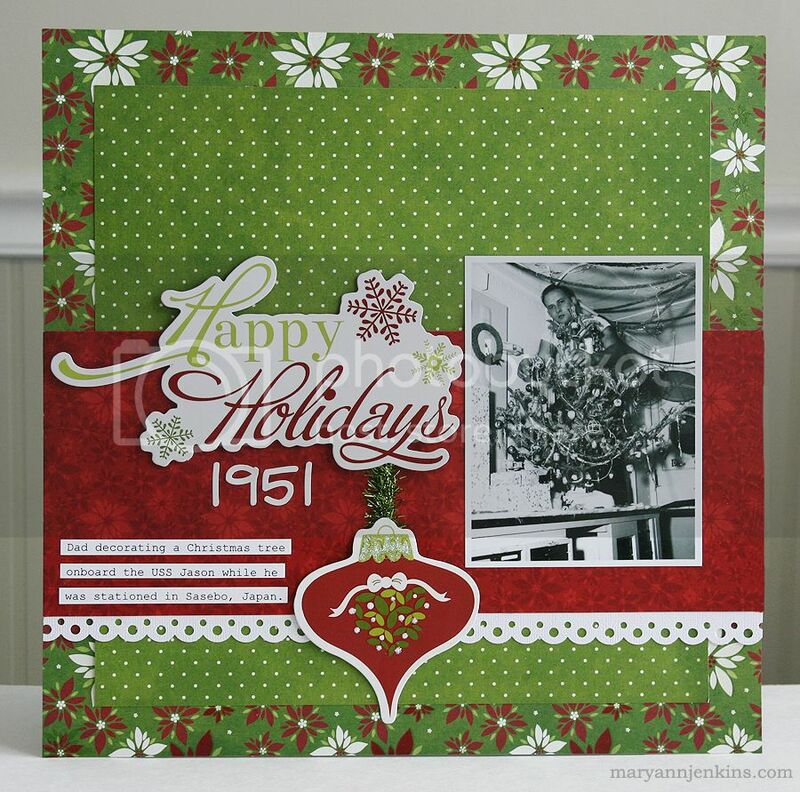 I love that the Christmas Cheer collection works perfectly with my photos from 2010 just as well as they do as a photo from 1951. The music would definitely help get me in the mood, especially in July. LOL! Beautiful pages. I love the pretty edging and stitching and bit of tinsel on the ornament. Wonderful pages! Great clean lines! I love a good, clean page! Music is a very good idea! Fabulous layouts. Christmas in July! I love the BW photo layout. Oh, these are cute as a button. Love the titles and embellies. Nice crisp clean designs on both Maryann! I really like that second one and how the all around border really highlights your page! Great pages! No better reason to enjoy some seasonal music! Such stunning pages, I love LOVE everything Christmas. It just makes me smile! Not a scrapbooker but LOVE paper and made other things. I hopped over via the made in a day blog hop. Uh-oh, I may have to try scrapbooking now! Visit the farm at sharonstanleywrites.blogspot.com and see what keeps me busy. Great pages you've got there!